In the mountains by the holy city of Thurfei are the tombs of those who have died in the quest to succeed to the Holy Imperial Throne. While there are a number of such tombs that house the dead of noble lineage, only one is said to also contain much treasure. When the 14 daughters of the Seventeenth Holy Emperor in Viridian rose up to take the throne from hir, it became less a challenge of assassination of the emperor and more of a power struggle within the fourteen daughters for whom would take the throne afterwards. To the surprise of not only the daughters of the throne, but to most of the court, the Seventeenth Holy Emperor in Viridian both still possessed the energy and will to bear the mighty powers of the throne, and the self-preservation to use it upon hir daughters. Unlike other pretenders to the throne, the fourteen daughters were entombed in their finery along with many of their favourite gewgaws, toys and decorations; making their combined tomb a potential prize worthy of any great robbery caper. There are actually only one major trap once someone has passed the wizard-locked front doors of the tomb. There are two massive stone blocks made of Lotus Stone from the Darkest Crimson Hell that are linked to just about everything in the tomb. These stone blocks slide out to seal the entrance and are magically inert due to their origin (as anyone with any decent arcane education should know, Lotus Stone of the Darkest Crimson Hell is always magically inert). The first pressure plate just past the stone blocks only trigger the blocks. The second pressure plate in the main hall triggers the blocks as well as the portcullis beyond them. Finally, each of the tombs of the Fourteen Imperial Princesses is linked again to this same trap. Perhaps someone of unearthly strength could reopen the portal, and of course transportation magics could get people out of the tomb… but for most would-be tomb-robbers the remaining option is to find the secret chambers where the controls for the portal’s machinery are and to reset the trap from there. Of course, once the stone portal is closed, the Fourteen Imperial Princesses lurch to consciousness again, trapped in their damaged and dead bodies, angry, hungry, and knowing full well that any robbers nearby were after their treasures. I generally work hard to avoid much symmetry in my maps. Symmetry makes it so players know what to expect around the corner once they’ve explored half the map. But there are times where symmetry works. With how much I avoid symmetry, it actually stands out as unusual if you generally use my maps in game. 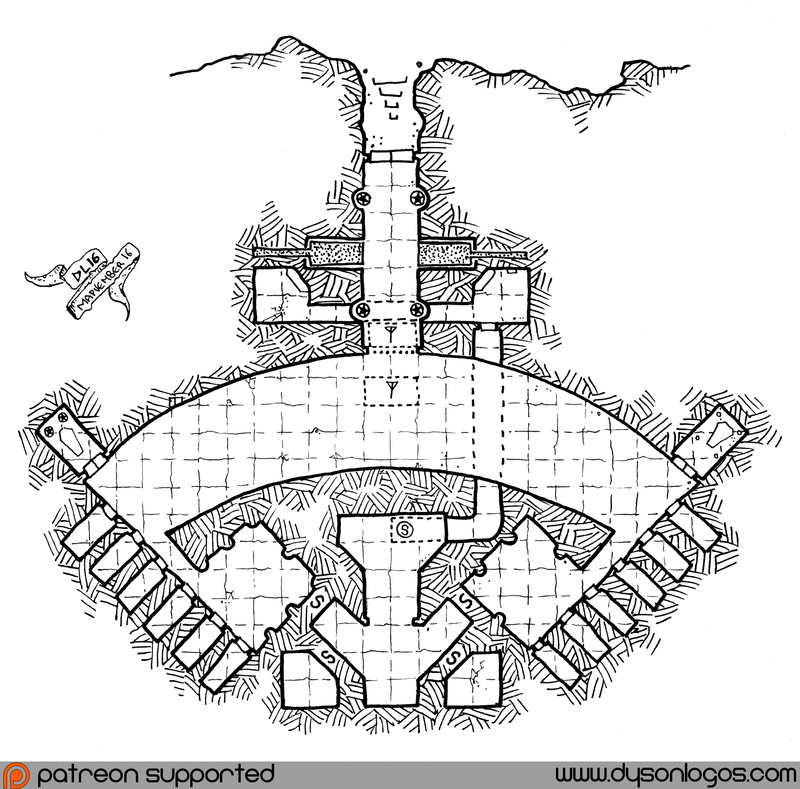 This map is made available to you under a free license for personal or commercial use thanks to the awesome supporters of my Patreon Campaign. Over 400 amazingly generous people have come together to fund the site and these maps, making them free for your use.